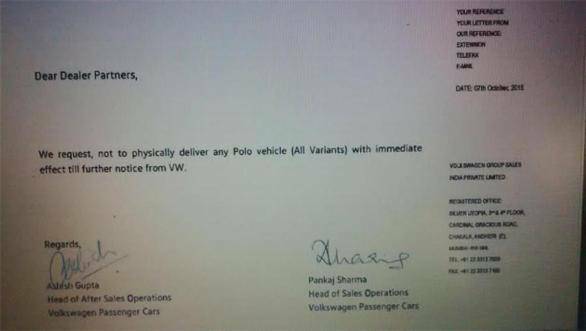 In a letter signed by its head of sales operations, Ashish Gupta and head of after sales operation, Pankaj Sharma, Volkswagen Passenger Cars India has asked all its dealers to suspend all deliveries for the Polo until further notice. But Volkswagen India maintains that this move has nothing to do with the recent emissions scandal. For those of you who've been living under a rock, Volkswagen has been in the eye of a storm  a very smoggy one at that. The German carmaker had recently admitted to cheating in their emissions tests in the USA using a 'defeat device'. This software has the ability to detect when the car is being tested for emissions, and automatically switch on all the emissions regulating measures for the duration of the test. When the test is complete, the diesel engine (specifically a unit called the EA198) returns to the regular driving mode, which when tested, produced 40 times the permitted level of nitrogen oxide (NOx). The issue has even led to the resignation of Martin Winterkorn as CEO for the Volkswagen Group. 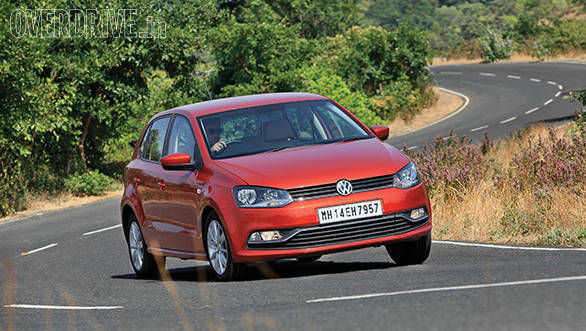 Volkswagen India has refrained from divulging any concrete details on the move to stop deliveries of the Polo. In a clarifying statement from the company, the move has been attributed to "a technical reason which is currently under evaluation." VW India further elaborates that this "concerns a limited number of cars out of a specific production period" and that deliveries of the unaffected Polo range will continue "as per schedule." The statement ends at "Volkswagen would like to clarify that the temporary hold on deliveries is not related to the ongoing EA189 diesel engine topic." Well, then, as editor Bert puts it, just bad timing then, eh?